Conga Composer is a Salesforce application used to create documents, reports, contracts, policy documents and presentations. All of these documents can further be customized for specific audiences, using the formats of PowerPoint, HTML, Excel and PDF, and many more. Such unique combination of formats and document creation tools make Conga a one stop solution which can be helpful in automating the workflow and processes, and save immense time navigating its user-friendly interface. 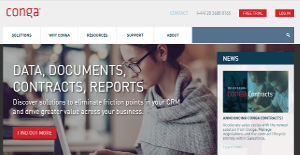 Conga Composer has been employed as a CRM document manager by many financial businesses, but its use is not limited to a specific sector or industry. Conga Composer gives businesses a variety of benefits, in particular when it comes to merging multiple merging documents in Salesforce. Conga Composer is mainly acclaimed for its cost and time effectiveness as it automates the workflows to produce more efficient results. Merging data from multiple documents is important while working on important projects. It isn’t easy to grab them automatically rather a manual effort is required, but with Conga Composer, no matter how complex it is, a merge button will fulfill the need in no time. Moreover, if you are producing heaps of documents such as receipts, then Conga Composer will handle those adeptly. While you produce customized documents, it is important that eSignatures are integrated. Conga composer integrated the 3rd party applications for eSignatures such as Docusign. So when you create the data and documents and merge them using Conga, you can send these documents to your eSignature cloud account to gather all the signatures. If you are new to Conga Composer then there may be many instances when you will get stuck over using its multiple features. The good thing here is that the support team is available round the clock to provide support of any kind to its customers. If you are considering Conga Composer it could also be sensible to analyze other subcategories of Best Document Creation Software collected in our database of SaaS software reviews. Each enterprise has different requirements and requires an application that can be customized for their size, type of employees and customers, and the particular industry they are in. For these reasons, no platform can offer perfect features off-the-shelf. When you try to find a software product, first be sure what you want it for. Read some Conga Composer reviews and ask yourself do you desire basic tools or do you want advanced functionality? Are there any industry-specific features that you are searching for? Find the answers to these queries to assist your search. There are plenty of elements that you need to reflect on and these include your budget, specific business wants, your company size, integration requirements etc. Take your time, use a few free trials, and finally choose the platform that provides all that you require to improve your firm effectiveness and productivity. How Much Does Conga Composer Cost? Conga Composer’s SMB and enterprise pricing information is available only upon request. Contact the company for more details, and ask for your quote. We realize that when you make a decision to buy Document Creation Software it’s important not only to see how experts evaluate it in their reviews, but also to find out if the real people and companies that buy it are actually satisfied with the product. That’s why we’ve created our behavior-based Customer Satisfaction Algorithm™ that gathers customer reviews, comments and Conga Composer reviews across a wide range of social media sites. The data is then presented in an easy to digest form showing how many people had positive and negative experience with Conga Composer. With that information at hand you should be equipped to make an informed buying decision that you won’t regret. What are Conga Composer pricing details? What integrations are available for Conga Composer? If you need more information about Conga Composer or you simply have a question let us know what you need and we’ll forward your request directly to the vendor.